The Membership Committee focuses on creating networking opportunities to enhance the CREW Boston experience of current members through Retention activities and to promote new membership through Recruitment activities. The Committee organizes events that vary in size and formality to encourage members to interact in order to cultivate personal and professional relationships with the goal of developing new business opportunities among members. CREW Boston strives to keep our members engaged, to recognize member achievement, and, above all, to provide quality networking opportunities throughout the year. Retention activities include planning networking and member appreciation events including the New Member/Legacy Council Reception, Legacy Lunch Series and the Women of Legacy Panel event, Dine Arounds, and the Committee Thank You Party. Retention activities also include membership renewals in conjunction with the CREW-administered renewal process. Please see the Prior Events section below for examples of the type of networking events offered to our members. CREW Boston continues to strengthen the organization by finding ways to attract new members and grow the membership. Recruitment activities include planning Member/Guest events and joint events with other real estate affiliated networking groups throughout the year to provide opportunities for women in real estate-related professions to network with CREW Boston members and learn more about our organization and the benefits of membership. Recruitment activities also include reaching out to the guests who have attended prior events to answer any questions they may have about the organization, encouraging prospective members to apply for membership, and providing assistance with the application process. In addition, the Ambassador Program for new members to CREW Boston is a program that was started to help new members immediately gain the most out of their membership. As part of this program, members of the Committee personally reach out to new members to welcome them to CREW Boston, encourage attendance and networking at upcoming events, and greet new members and guests at luncheons. The Membership Committee welcomes members with creative minds who enjoy selecting exciting venues, organizing out-of-the-box events, and facilitating introduction, communication and collaboration among our members. The committee typically meets the third Tuesday of the month at 12:30 p.m. Please email the co-chairs listed at the top of the page with any questions about the Committee. Attendees of the Discover CREW Boston and Wines from Around the World enjoyed a fun evening of conversation and wine in October. Members and guests had the opportunity to hear about the organization’s amazing committees and groups while sampling 8 wines from around the world along with some delicious hors d’oeuvres! The room was filled with great energy and excitement as members, guests and committee volunteers mingled and networked. This was a great way for those new to the organization, as well as potential members, to learn more about CREW Boston and all the different way to to get more involved. Thanks to all the committee volunteers and our host, Margulies Perruzzi Architects, for making this a great evening. On Tuesday, June 27th CREW Boston committee members were honored for their hard work and commitment to the various committees that make CREW Boston successful. The event was held at the beautiful Society of Arts + Crafts in the Seaport and while networking, members were able to see the works of Tanya Crane, Janice Jakielski, and Julie Morringello, the 2017 Artist Awards winners. We heard from Fabio Fernandez, Executive Director of the SAC to learn more about the organization and its roots starting in 1897. Each year CREW Boston comes together to welcome our new members and to celebrate our legacy members, who include our longest-standing members and our past presidents. This year, we were honored to have with us many of the founding members of our organization which gave us a chance to honor our beginnings, where we started, how far we have come and what our future looks like. The over 100 members in attendance had a chance to hear from a couple of them and was inspired by their commitment to the promotion of women in the real estate industry and how it all began. CREW Boston was excited to present a panel comprised of four CREW Boston Legacy members, Kathleen Ahern, Kathleen Joyce Kusiak, Laura Marshall and Joan Parsons, leaders in the real estate community. The panel was moderated by CREW Boston immediate past president, Leslie Cohen and there was time for attendees to ask questions and network. These amazing women participated in last year's Legacy Lunch Series, and we were delighted to have them together for an evening of candid discussion. 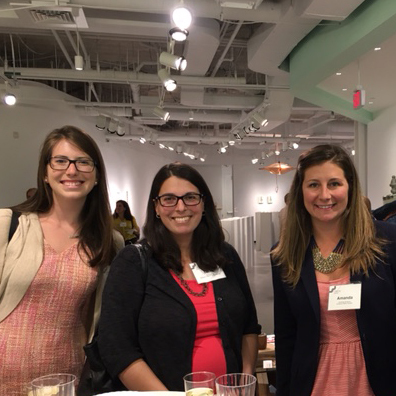 Attendees of the Networking, Wine and CREW Boston enjoyed a fun evening of conversation and wine in October. Members and guests had the opportunity to hear about the organization’s amazing committees while sampling 8 great wines and hors d’oeuvres! The room was filled with great energy and excitement as members, guests and committee volunteers mingled and networked. This was a great way for those new to the organization to learn about how to get more involved. Thanks to all the committee volunteers and our host, DLA Piper, for making this an enjoyable evening. CREW Boston committee members enjoyed a beautiful evening on the Roof Top at Ink Block in June. It was an opportunity for the organization to say thank you to all of the volunteers that work tirelessly to make CREW Boston great! Members were given tours of the interior spaces at Ink Block along with enjoying cocktails, hors devours and great conversation on the roof top poolside patio. The evening was capped off with lots of amazing giveaways for attendees. Thanks to all the members and friends of CREW Boston that contributed to this great event! CREW Boston members enjoyed a lovely lunch and great conversation with Joan Parsons at Riemer & Braunstein on June 7, 2016. Joan is a Senior Partner at the law firm and has been an active member of CREW for many years, including serving as CREW Boston’s 2010-2011 President. The conversation focused on three main themes. Over 50 members and guests gathered for networking at the Long's Jewelers in the heart of downtown Boston. As part of May Foundation month, donations were collected at the networking reception in support of the CREW Boston Educational Foundation and the CREW Network Foundation. Members and guests mingled throughout the store over appetizers and wine and received a spa cleaning for personal pieces of jewelry, VIP discounts on purchases made, and a gift of jewelry cleaner at the conclusion of the event. A special thank you to Long's Jewelers for hosting us and supporting the Foundations.